The Goldenrod Historical Society was officially incorporated on October 17, 1984. It is a non-profit and tax-deductible organization, the goals of which are to collect and preserve the history and memorabilia of both Seminole and Orange County sections of the unincorporated com-munity of Goldenrod. Ten years of hard work and dreaming on the part of many Goldenrod citizens came to fruition on Friday, August 11, 2000. 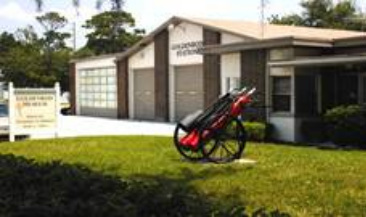 On that day, the Goldenrod Historical Society accepted the keys to the Goldenrod Fire Station from Orange County as the first step in developing a new Community Center to be called the Goldenrod Station and Museum. Celebration of the Grand Opening of the Museum was held on October 6, 2001. As a community center the renovated Fire Station is also available to the community for business meetings, club meetings and social events. The rentals from these events help defray the cost of maintaining the Station. The Goldenrod Station houses the Goldenrod Historical Society & Museum. Each year Goldenrod celebrates the “Goldenrod Festival and Parade” in the fall. Check out our list of upcoming events under the "More" icon above.